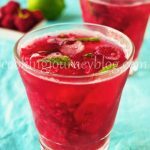 Raspberry mojito is a refreshing sugar-free non alcoholic drink for party or for every day! Smash raspberries with fork and divide them to 2 x 200 ml (6.8 oz) glasses. Cut lime in half. Squeeze the juice of one half to both glasses. Other half - cut round slices and add to the glasses. Fill the glasses with sparkling water or soda till 3/4 of the glass, and mix with a spoon. Add ice cubes. Add whole raspberries. Serve and enjoy!